Coming into this postseason, there were many concerns about the world champion Phillies’ chances of repeating this year: their bullpen was in question, their new ace was struggling, and their offense was in a funk in almost the entirety of September. With game one of the NLDS now over, the Phillies responded to two of the three concerns with style in their 5-1 victory over the Colorado Rockies. For the Philadelphia Phillies, the first step on the way to a repeat as world champions will be a five-game series against the Colorado Rockies in the NLDS. Last time these two met in the postseason, the Rockies swept the Phillies in three games during the NLDS as they went on to take their first National League pennant. These two meet once again in 2009, with the memories of 2007 fresh in their minds. The Rockies win if: Their pitching can keep the Phillies’ bats cool. The Phils come into the postseason with four days of rest since their last truly meaningful game, which could mean a slow offensive start for the defending world champs, especially with legitimate ace Ubaldo Jimenez ready to go in game one. This task is made more difficult with the recent loss of starter Jorge De La Rosa for the series, but a return to All-Star form by Aaron Cook may make up for that. If Colorado can keep the likes of Ryan Howard and Jayson Werth off the bases, then Rocktober will be extended through at least next week. The Phillies win if: Their bullpen can hold up their end of the bargain. The final nine outs of the ballgame have been one giant puzzle for Charlie Manuel this season, and he will have the rough job of piecing together a save each night of the playoffs when the stakes are raised. The combination of Brad Lidge, Scott Eyre, Ryan Madson, and possible either J.A. Happ or Pedro Martinez will have to regain the confidence of the 2008 edition to ensure that the Phillies don’t look more like the 2007 team. The X-factor: The ballparks. 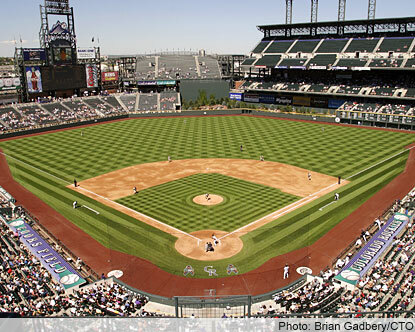 Coors Field and Citizens Bank Park are not known for their famous pitching duels. Both parks, in fact, are considered to be more of a launching pad than Cape Canaveral, which means the long ball will probably make its appearance early and often in this series. When you add the power-hitters on both sides of the series, you may end up seeing more crooked scores than usual in a playoff series. The Verdict: While they are not the bullpen of last year, the Phillies relievers know what it takes to play late into October. Despite the possibility of hiccups from the relief corps, Colorado has noted struggles against left-handed pitchers, and the Phillies are loaded with southpaws. Both Eyre and Happ get a workout while Howard and Werth take advantage of the friendly dimensions of both home stadiums. Despite putting up some tough competition, the Rockies will ultimately miss the talented arm of De La Rosa and lose the series in four games. How do you liven up a boring game against the Washington Nationals? Try cute little kids. That’s the recipe the Phillies used on Tuesday, and it’s landed the little girl and her family on NBC’s Today Show tomorrow morning. The father, Steve Monforto of Laurel Springs, N.J., is a lifelong Phillies fan and season-ticket holder. But through all the games he’s seen, it was the first foul ball he had ever caught. And as quickly as he reached over the railing to snag the fly ball off the bat of Jayson Werth, he was watching fly right back toward the field of play out of the hand of his three-year-old daughter, Emily. After the ball flew off, Monforto quickly hugged his daughter to reassure her everything was ok. As far as the ball, there were a host of Phillies’ executives, seated a few sections over in the 300 level and including General Manager Ruben Amaro, Jr., who quickly came over to replace it.